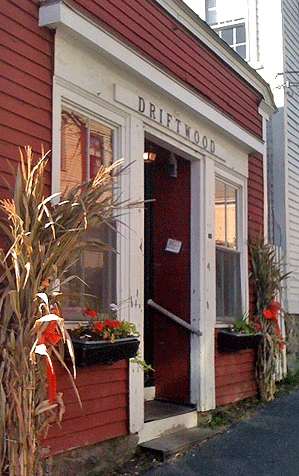 The Driftwood Restaurant has been a Marblehead institution for so long we’re surprised it hasn’t been granted official historic landmark status. And while its reputation has gone up and down over time, and earlier this year it was closed for a while due to a tax issue, it remains a local favorite and still boasts a line out the door on weekend mornings. The interior décor is diner meets clam shack, with nautical doodads and work by local artists adorning the counter area and walls. The small tables covered with red and white checked vinyl cloths are set pretty close together, and on a busy day, you may end up chatting with your neighbor as you chow down. The crowd includes everyone from crusty old locals who all know each other to young families and summer tourists. The coffee arrived quickly, and while it’s never going to threaten the local coffee house business, it was respectable. The omelet was decent, and we liked the wide range of breads on offer for toast. The waitress warned us ahead of time that the corned beef hash was cooked to order so it could take longer, but the wait wasn’t noticeable, and the hash was quite good—savory and not greasy. 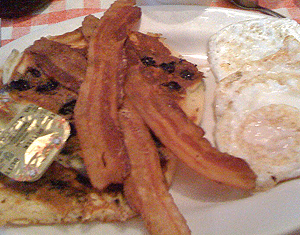 The breakfast special was definitely satisfying, with crispy bacon and eggs cooked to order, and the winner of the morning was the blueberry pancakes. Fluffy, golden, and studded with fresh berries, they were delightful. The waitress was quick to refill our coffee and didn’t rush our check, two things we appreciate anywhere, but especially at a busy diner. The restaurant is primarily known for its breakfast, as it opens at 6:00 a.m. and closes at 2:00 p.m. We hear the lunch menu features a pretty good lobster roll, though we haven’t tried it yet, and the famed fried dough served only on weekends and holidays sounds inviting as well. Like a weathered old wharf rat sitting at the town landing, the Driftwood may be rough and tumble to look at, but it’s full of salty charm. Kristen, this sounds like an interesting place. I do not believe I have ever seen or heard of it. I wonder if at one time it was related to the Foster Street Diner in Peabody? For a while that place was operated as the Driftwood II. lol no quarrels with the nuts and bolts of your article but let’s get real… there’s nothing “charming” about “the Driftwood.” Maybe it’s in the eye of the beholder and you are just a charming person and I’m not. But, like you said, it’s “diner meets clam shack”, ’nuff said.